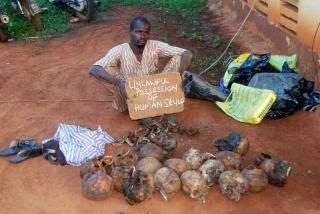 The Ogun State Police Command, yesterday, said it had nabbed a 38-year-old man, Adelani Ayomide, with a bag containing 18 human skulls. The state Police Public Relations Officer, Muyiwa Adejobi, in a statement, said the suspected ritualist was arrested at 6:48am, yesterday, on Ado-Odo, Owode Road by policemen attached to a division in Ado-Odo-Ota Local Government Area of the state. Adejobi said: “Policemen attached to Ado-Odo Division, while on a stop-and-search exercise along Ado-Odo Owode Road sighted a pedestrian, Adelani Ayomide, 38, of Ilaro, Ogun State with a bag containing 18 human heads. “The suspect will be transferred to the state department of investigation, Eleweran Abeokuta, for discrete investigation. Meantime, four Policemen have been honoured by Police Community Relations Committee, PCRC, in the state. Those honoured yesterday, include Muyiwa Adejobi; Officer in charge of the Special Anti-Robbery Squad in the state, Ahmed Tijani, and two Police Officers at Agbara and Ogijo, Ayodele Sonubi and Toyin Afolabi, respectively. Speaking at the event, which was held at Police Officer’s mess, GRA, Oke-Ilewo, Abeokuta, the state Chairman of PCRC, Chief Moshood Sule, commended the command and its officers’ performance in the state.